Bought last summer from Sporting CP for £2.7m, Ezequiel Schelotto featured relatively regularly under Chris Hughton during the 2017-18 season, featuring 24 times for the Seagulls. This campaign, however, has been very different, as the 29-year-old has yet to set foot on a football pitch in all competitions, which he’s not best pleased about. 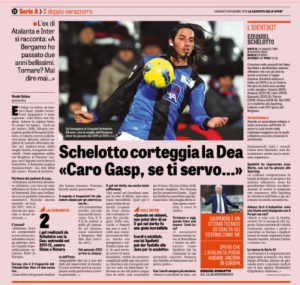 While he didn’t come across as angry about his situation at AMEX Stadium, Schelotto made it clear in an interview with Gazzetta dello Sport that he might not be able to continue like this for the rest of the season. Asked if he missed Italy, where he spent a large chunk of his career prior to his move to Portugal in 2015, he said: “The Premier League is the most important league in the world, but I remained linked to Italy. These days, I’m not playing a lot, so I’ll speak to my agent Alessandro Grigoletto in January and we’ll see”. The defender was left out of Brighton’s 25-man Premier League squad back in mid-August, in which he cannot be included until the next transfer window. Choosing to represent Italy instead of Argentina (born in Buenos Aires) internationally, Schelotto has one cap to his name, which he picked up in 2012, and played for their U21s seven times.